Little Ricky's kindergarten class runs short of cast members for its annual play, and the Ricardos and Mertzes are drafted. Although Ricky expected to be chosen as the play's producer and director (Clifford Terry, who runs an orange juice stand, got that job), he is given the part of a hollow tree. Lucy is to portray the wicked old witch of the forest, Fred will play the role of Hippity-Hoppity, the friendly frog, and Ethel is lucky enough to be the coveted Fairy Princess part (only because she fits the costume worn last year by Jimmy Wilson's hefty mother). The Ricardos become concerned when Little Ricky is chosen to play the boy lead; they don't know whether he can handle the responsibility and pressure. Certain that they and the Mertzes will be close by, Lucy and Ricky cease worrying. The pageant opens with young Suzy reading to Billy (Little Ricky) from a storybook entitled "The Enchanted Forest." The mini-production goes well, despite Little Ricky forgetting some of his lines, and all are glad when the finale featuring over thirty little children comes to a close. Special Notes: Most of the pageant is filmed after the audience has gone home because of the amount of children involved and the technical aspects. 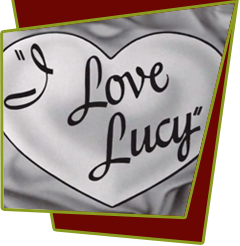 Bloopers: As Lucy helps take off Little Ricky's jacket, the front door of the apartment is completely open. In the next shot, Fred enters the apartment by opening the door.